Lyndon LaRouche today returned to the National Press Club in Washington, D.C., for the first time since 1986, to deliver a powerful repudiation of both of the two major party presidential candidates, and warn that the world is facing the gravest crisis in modern times, centered on the immediate danger of thermonuclear war and a trans-Atlantic hyperinflationary breakdown. LaRouche was joined in the press conference by Jeffrey Steinberg , a senior editor of LaRouche's flagship publication, Executive Intelligence Review. The conference was attended by diplomats from Western Europe and Africa and by media from the United States, Eastern Europe, the Middle East and South America. The entire event was recorded by three TV networks, including LPAC TV, which will be posting the full video of the press conference, along with a transcript, within the next 24 hours. LaRouche began the press conference by spelling out the strategic crisis and the fact that neither Obama nor Romney was qualified to deal with the crisis. Obama's re-election, LaRouche warned, would be tantamount to guaranteeing thermonuclear confrontation between the United States, Russia, and China — with the triggers already set in the unfolding Syria crisis. "The crucial issue, the most crucial issue, is the threat of thermonuclear war. That is the pregnant issue going on here. "Now, the incumbent President is for a military confrontation, which, in fact, if it's executed, will be thermonuclear. And as most of you who are experienced know, thermonuclear war would begin, perhaps, launched by Mr. Obama, on behalf of the United States, and within minutes after Mr. Obama had launched World War III, or 5, or 6, or whatever it's going to be, you would have then a reaction from certain European nations, which would be called into play under their agreements. You'll have Russia, China, and probably India as the principal leaders of the opposite side. "And therefore, the key issue here is not the election. The key issue here is: Will this crisis, this economic crisis—which is worldwide, with hyperinflation accelerating every hour in Europe; with hyperinflation coming in the United States." LaRouche sharply denounced the failure of both candidates to address any of the crucial issues during their final debate in Boca Raton, Florida, and warned that the economic policies of both Obama and Romney will make it impossible for the U.S. East Coast to recover from the devastation brought by Hurricane Sandy. He warned that people are already dying as the result of the murderous economic policies of Obama and that Romney offered no genuine alternative. The fact that Romney failed to attack President Obama for the cover-up of the 9/11 attack in Benghazi, LaRouche warned, was the clearest indication that he will not fight for the truth. With that, LaRouche turned the microphone over to Steinberg, who presented the evidence, drawn entirely from declassified U.S. government documents, that President Obama failed to protect the diplomats in Libya, when he had ample warning, months in advance, that the country was being overrun by Al Qaeda and related Jihadi terrorists. Steinberg produced blow-ups of 12 documents, released to the public by the State Department and the House Government Reform and Oversight Committee, showing the depth of intelligence that had been passed to the Obama Administration about the growing security threat in the Benghazi area. The documents included three email transmissions from the U.S. Embassy in Tripoli, Libya, as the attack on the Benghazi consulate was taking place. Those emails showed that top officials in the Obama Administration, including in the White House Situation Room, knew that there was no large demonstration at the consulate — just a heavily armed attack by 20 or so terrorists. Yet, Steinberg reminded the audience, UN Ambassador Susan Rice and President Obama, himself, repeatedly went on national television and lied to the American people about the Benghazi attack — to cover up the fact that Al Qaeda and allied Jihadi groups were not crushed, as Obama had repeatedly claimed in campaign appearances around the country. A lively question-and-answer period followed, in which LaRouche repeatedly focused on the imminent danger of thermonuclear war and the extermination of much of humanity. He and Steinberg were asked to explain how the Libya invasion in 2011 was related to the ongoing danger of thermonuclear war. LaRouche developed the concept of empire, showing a continuity of imperial policy going all the way back to the Trojan Wars. He and Steinberg both developed the role of the Anglo-Saudi alliance in the original Sept. 11, 2001 attacks and the second 9/11 attack in Benghazi. LaRouche reviewed his own January 2001 warnings about a major terrorist attack in the United States, aimed at providing the Bush-Cheney administration with the pretext to go for outright dictatorship and war. Obama has been a continuity of the Bush-Cheney drive for dictatorship, and his continuation in office will all but guarantee thermonuclear war. LaRouche and Steinberg both reviewed the crucial role of the U.S. Joint Chiefs of Staff, along with the Russian and Chinese governments, in stopping the outbreak of general war up until now. If you do not wish to receive more emails from Stu Rosenblatt, please reply to this message with "Remove me" in the subject line. 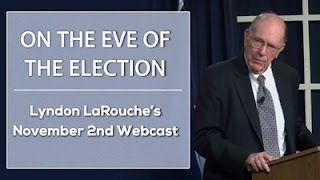 The fifth in a series of Friday webcasts by Lyndon LaRouche addressed to the American population, leading up to the November 6th presidential elections. The people in New York and New Jersey who were the most vulnerable to the effects of Super Storm Sandy also happen to be the same populations targeted for elimination under the brutal fascist austerity plans of President Barack Obama and his minions, including New Jersey Gov. Chris Christie and New York's greenie billionaire Mayor Michael Bloomberg — the poor and the elderly. A number of the high-rise apartment buildings in both places that lost power were either low-income housing projects or housing for the elderly. When they lost power, elevators, air conditioning systems, lighting, refrigerators, and other appliances necessary for life in these structures all stopped functioning. Acquiring food and water suddenly became impossible. As of mid-day, today, five apartment buildings for senior citizens in Paterson, N.J., were still without power, reported the Bergen Record. As of Friday, there were nine high-rise buildings in Fort Lee without power and several more in Hackensack and Cliffside Park. Some have had emergency generators keeping the elevators operating, but in Edgewater, people have been living in buildings without any power at all. In one building in Fort Lee, many of the elderly residents have been congregating in the first floor lobby, but some are too frail to leave their apartments and need help. In New York City, a dozen people over the age of 65 died in the storm. According to an accounting by the Associated Press, they included a 90-year-old woman who died in her apartment on Coney Island; a 75-year-old woman in Manhattan's East Village who died after her oxygen supply was cut off when the power failed; an 82-year-old man killed by the rising water in Staten Island; an elderly couple who apparently drowned beside their car in a parking lot also on Staten Island, and there were others, too weary or frail to heed evacuation orders before the storm. Friday, Rep. Gregory Meeks (D-N.Y.), whose district is made up of a large part of Queens, told CNN's Erin Burnett that "No one on the peninsula from east to west has power." Fifty percent of Meeks' constituents live below the poverty line and most of them don't believe that they're getting the help they need (as on Staten Island). And, as Lyndon LaRouche pointed out Saturday, there are no plans among any of the current political leadership to take the necessary measures to mitigate the effects of such storms in the future. Bloomberg made that clear on Nov. 1, when he rejected calls for the construction of storm barriers for New York like the one that successfully protected Providence, R.I., from Sandy, last week. Fox TV continues to receive detailed leaks from within the U.S. military and CIA showing that President Obama lied to the American people about the Sept. 11 terrorist raid on the U.S. consulate in Benghazi, Libya. According to a news report dated Nov. 2, the CIA's timeline of response to the Benghazi attack included the following account, from 1:15 AM: "First idea is to go to a Benghazi hospital to recover Stevens who they rightly suspect is already dead. But the hospital is surrounded by the al-Qaeda linked Ansar al-Sharia militia that mounted the consular attack." According to Fox TV, six hours earlier, at 7 PM, U.S. military intelligence told commanders that Ansar al-Sharia did the attack. The report contained no caveats. Fox also reported that eyewitnesses in Benghazi told of armed militia staging three hours in advance of the assault on the consulate. All of these reports, accumulated as the attacks were still underway, made it clear that top officials of the U.S. intelligence community, including Pentagon intelligence units, were fully aware that the attack was the work of heavily armed terrorists from Ansar al-Sharia. Yet, five days later, UN Ambassador Susan Rice went on five national television shows to lie that the attack was actually a spontaneous demonstration triggered by the now infamous video slandering the Prophet Mohammed. President Obama followed Rice on two additional national TV shows later in the week, repeating the same lies. He then repeated them again in his address before the UN General Assembly. Fox also raised questions about why some of the major interagency units tasked with dealing with terrorist attacks were not mobilized during or after the consulate assault. For example, the Foreign Emergency Response Teams (FERTs), State Department, CIA, and JSOC joint units that were dispatched to Kenya and Tanzania following the 1998 embassy bombings, were not sent to Benghazi. The FERTs are trained to secure facilities after an attack. 24 days after the 9/11 attack in Benghazi, the FBI had still not been able to go to Benghazi to secure the crime scene, and when an FBI team did finally reach Benghazi, it stayed for several hours and then returned to Tripoli, leaving sensitive documents on the scene with no security. As the result of the failure to secure the consulate site, new draft cables from Ambassador Stevens were found in the safe room of the consulate, indicating that the Ambassador was concerned about reports of hostile surveillance of the facilities by local Benghazi police hours before the attack. It is not known whether the cable was ever finished and sent off to Tripoli or Washington. According to Fox, the Counterterrorism Security Group, another interagency sub-cabinet working group assigned to prepare recommendations to the NSC on how to respond to terrorist attacks, was also never activated during the Benghazi crisis. Saturday, Fox TV had further reports, debunking other details of the CIA account of the response to the Benghazi attack. According to sources who were on the ground in Benghazi the night of the attack, calls went out to both the consulate and the CIA annex, warning at least an hour before the attack began, that it was imminent. Ansar al-Sharia had not only staged with heavy weapons near the consulate three hours in advance. It had set up roadblocks to seal off the area. According to Fox, the on-site manager of the Blue Mountain Security firm contracted to provide some of the consulate security was "distraught" over what was seen as a looming attack. Libyan sources in Benghazi further corroborated these accounts, adding that the CIA summary released on Thursday night was only "loosely based on the facts" and "doesn't quite add up." One former Special Operations officer, now doing contract security work in Benghazi, told Fox TV that the consulate was not secured, and that the "safe room" did not meet U.S. standards. Specifically, he said that a safe room must always have fire suppression and ventilation in case of a fire. "Ambassador Stevens would likely be alive today if this simple and normal procedure was put into place," the operative was quoted as saying. Fox TV also cited other local sources in Benghazi who said that there were armed drones in the area available for deployment, along with other air assets, including F-18s, AC-130s, and helicopters, that could have been dispatched. The sources reported that armed drones were deployed to monitor Libyan chemical weapons stockpiles in the area. And in another potentially damning revelation, sources reported that the response team sent in to Benghazi from Tripoli was held up at the airport for three hours. Calls to Washington to break the logjam were made after 30 minutes, yet nothing was done. The lack of proper response, one American official on the ground told Fox, was the result of "complete incompetence."